Vic Gundotra, VP of Engineering for Google, explained at Google I/O last May that Google intend to deliver a whole lot more than just applications on the Android Market by demonstrating a Android music download service. It seems Google don’t plan on stopping with just music downloads as a recent report in The Wall Street Journal explains that Google are trying to lure publishers into supporting a “digital newsstand” service for Android. Sources say that Google’s newsstand service will provide apps from publishers that allow Android users to view newspapers and magazines on phone and tablet devices. With Android now activating over 300,000 Google branded devices per day it seems only inevitable that publishers will eventually jump on-board. Google are supposedly in contact with Timer Warner, Condé Nast and Hearst, three large publishers, regarding the service however “details of the newsstand venture and its timing remain vague”. Apple already provide publishers with the ability to sell periodicals through their iTunes service so expect competition to intensify if Google can get their newsstand product off the ground. Amazon also made a big announcement today with their Kindle service as they intend to launch Kindle applications for both Android and Windows tablets. Amazon previously announced that they have a Windows Phone 7 Kindle app in development and already have a Android app that is designed for smartphones but the applications announced today specifically target tablet devices. 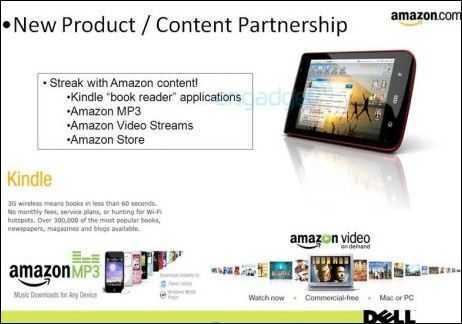 Dell Mini 5 to Come with Amazon Books, Music, Video Capability. This makes complete sense. Google provide the application channel and Amazon provide the content channel for the Dell Mini 5. [ Information] This will set it apart from the rest of the bunch so Archos are going to have to think carefully about where they go next. A raw Archos tablet with no apps and no content channel is going to look naked next to the Dell Mini 5. As will all the other raw Android builds we’ve seen so far. The information comes from Engadget who got hold of a promotional flyer for the Dell Mini 5 that reveals the partnership. Dell probably have an exclusive on this based on the hardware form factor and video capabilities but I’m sure it won’t be long before you’ll find the .apk floating around. Maybe even in the Google Marketplace. A second flyer reveals a colorful range of finishes which points towards a solid consumer focus. Let’s hope the prices are pointed that way too. More Dell Mini 5 information and links in the database.